In 625 B.C the Korinthians came and stayed at Amvrakia, where there was the settlement of Dryopes. 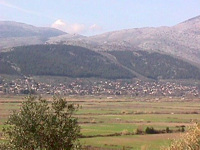 Its location was at the same place where there is today the city of Arta. 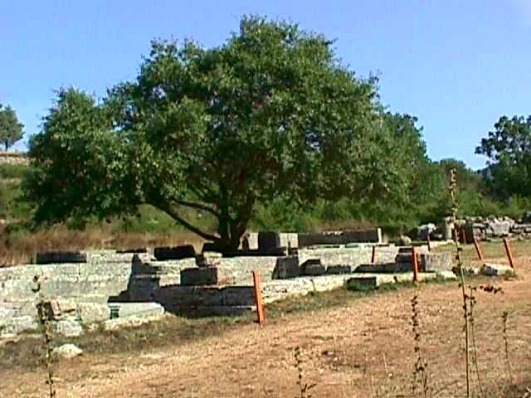 Later, the Korinthians sent away the local habitants and constructed walls for Amvrakia. 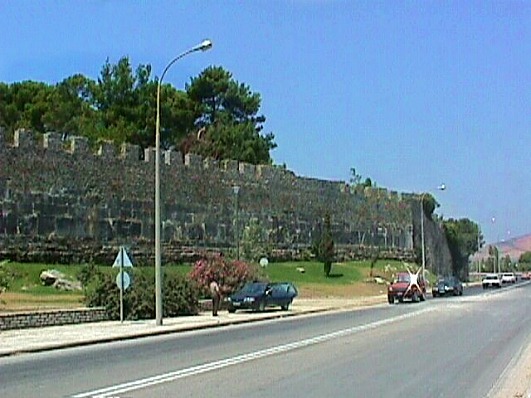 The town had a fortified port, Amvrakos, which was an exit to Amvrakikos bay. For the history of the name of the town there are many different versions. The most probable one is that derives from the daughter’s name of the Dryopes’ king, Melaneas, whose name was Amvrakia. Amvrakia was the biggest town of Epirus, with a population of 100.000 habitants and took part in the battleship of Salamina against the Persians as well as in the battle of Plataies. The strength of the town was shocked when it was defeated by the Akarnians and the Athenians at the battle of Olpes in Amfilochia, in 426 B.C.. In 338 B.C. it was conquered by the Macedonians, who in the end gave it in Pyrros, the king of Molossoi. In 295 B.C. Pyrros transfered here the capital of his state and decorated it with significant building (a royal palace, 2 theatres, temples, monument of Aineias, parliament, market, music school, statues of the 9 Muses, etc.). In 187 B.C. is conquered by the Romans who later looted it (167 B.C.) and in 31 B.C. they transfered its habitants to their new established town of Nicopolis. 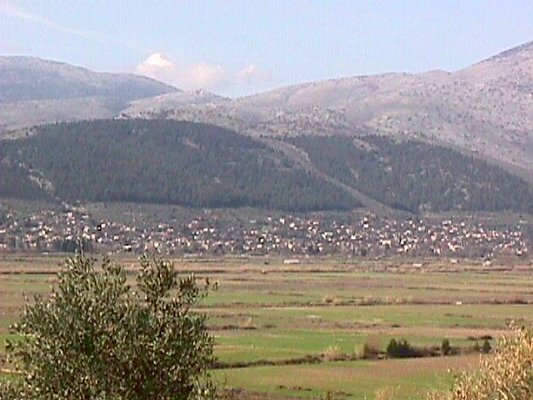 After 1000 years, at the location of ancient Amvrakia, it was built the today’s city of Arta. 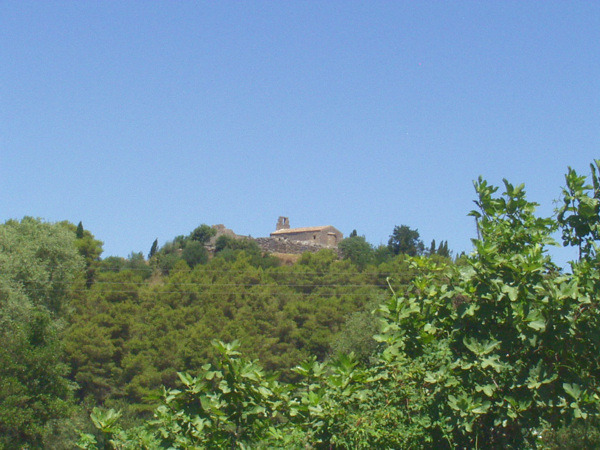 Nowadays are saved at the old city of Arta parts of the castle and ruins of ancient Amvrakia. It is also saved the ancient theatre of Amvrakia which is close to the church of St. Constantine, at the centre of ancient Amvrakia. 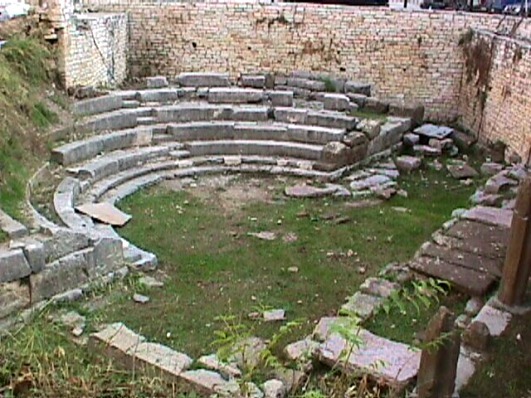 It is about a small theatre built in 4th – 3rd century B.C. You can easily see the place of the orchestra and 4 rows of stands. The place of the orchestra is a perfect circle of a 6,70 metres diameter. During the succesive excavations were revealed a lot of findings that there are exhibited at the αarchaeological museums of Arta, Ioannina, Athens and London. The findings include jewels, ancient vessels, urns, coins, many kinds of tombs, fortification, etc. During the excavations was also revealed the Holy Road of Amvrakia, inside the city of Arta, with a width of 12 metres. At this place it was also found a funerary stone with a rare archaic sign of the 6th century B.C. and the names of dead people, but also the name of Amvrakia, written in the Doric language. 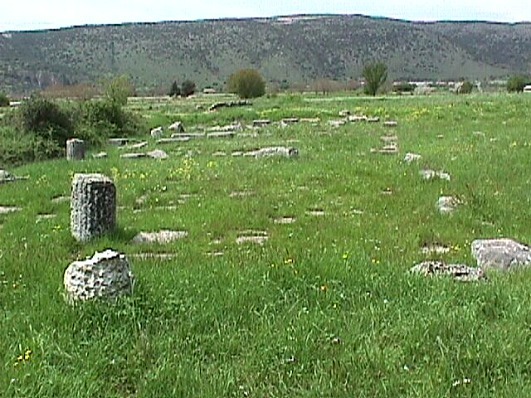 The site of ancient Amvrakia is always open with free entrance. The interest of finding lost Dodoni started by the mentions for Dodoni of: Aeschylus, Sophocles, Platon, Homer, Hesiod and others, but also from the legends of the tradition. 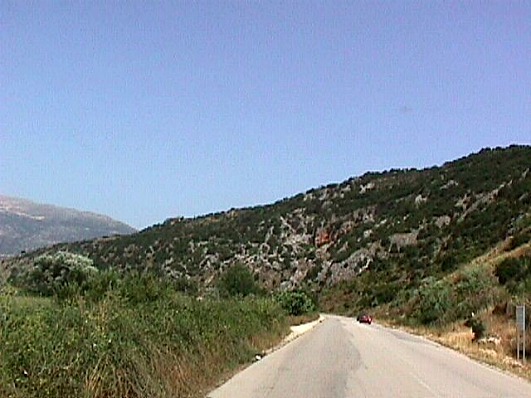 In 1875 an excavation took place at the location between Manoliasa and Olytsikas (Tomaros), 22 km. southwest to the city of Ioannina. 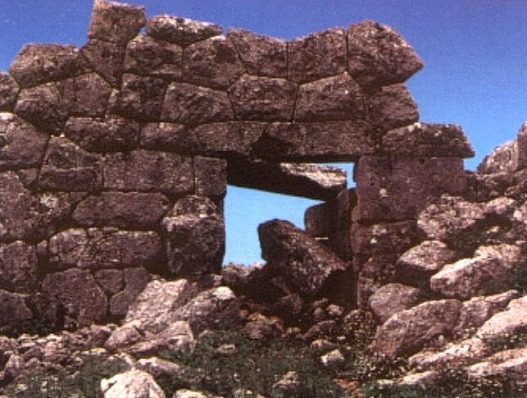 The research took place under the supervision of K. Karapanos who discoverd the temple of Zeus (the holy house) with findings from the copper age. Prehistoric vessels, weapons, brooches, coins, bracelets, signs, resolutions, statues, etc. are the first findings that are exhibited at the Archaeological Museum of Athens. Other excavations took place after the year of 1913 by G. Sotiriadis and Evagelidis in 1925 – 1935. During the decade of 1950 an organised research takes place (by Evagelidis – Dakaris and Dakaris – Mouselimis) which brings to the surface the theatre and many findings (vessels, statues, coins) that are exhibited at the ΑArchaeological Museum of Ioannina. 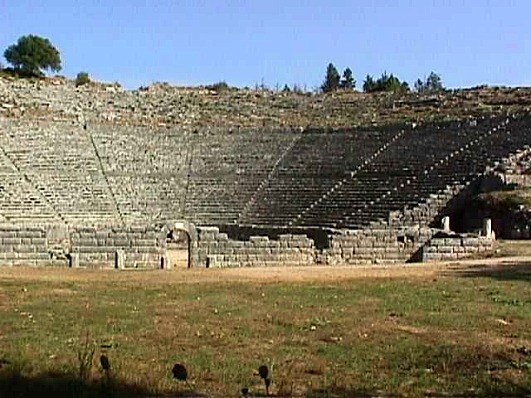 The archaeological company and the University of Ioannina reconstructed the theatre and the stadium. Homer’s poets are the oldest testimonies for Dodoni, where at the beggining Earth goddess was worshiped (3.000 B.C.) to whom sacrifised the holy bull for a fertile land. Selloi (a race from Thesprotia) who lived in Ellopia established the worship of Zeus and Dryo (1900 – 1400 B.C.). Vessels on tripods around the holy oak tree (PHYGOS), priests and priestesses (prophets, seeks) who live in huts, sleep on the ground so as to become one with Earth is the image of the ancient oracle. They predict the future according to the rustle of the leaves of the oak, the whistling of the pigeons that live on the holy tree and the sound of the water flow of holy spring. The seers beleived that one of the two goddesses of Thiva in Egypt, that was taken by the Phoenicians, came here like a pigeon on the braches of PHYGOS and asked with a human voice to become this place an oracle. They also believed that Zeus and Earth goddess (who later renamed to Dioni), lived under the branches of the holy tree. The construction of the buildings in the region started on the 4th century B.C., the temple of Zeus (with supplemental bulidings finished on the 2nd century B.C.) The theatre one of the biggest in Greece, of 18.000 seats, was built on the 3rd century B.C. by king Pyrros. The parliament buliding on the 3rd – 4th century B.C. The prytaneum is the most ancient building after the holy house where they stayed the priests of Zeus or the rulers of the “Common of Molossoi”. 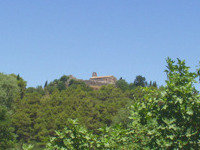 The cittadel of the settlement with a polygonal wall which is located on the top of the hill was built on the 4th century B.C. The wall and the temples of Hercules and Dioni were built by king Pyrros. After the year of 300 B.C king Pyrros created the religion of Molossoi (Olympian Gods), built the theatre and organised Naia and other athletic events every four years (sacrifices, running and other spotrs events). All these buildings were destroyed a lot of times: By the Aitolians in 219 B.C. and are rebuilt by Philip B’, the king of Macedonia. In 167 B.C. was destroyed again by Aimilios Paul of Rome (August rebuilt it once again and uses the theatre as an arena). During the period of Theodosios the Great in 391 A.D. the holy tree is cut, the oracle closes and two christian churches are built. Two more destructions follow and the habitants abandon the place of Dodoni. Nowadays, every summer, the place revives with perfomances of anciene drama and comedies that are played with great success. 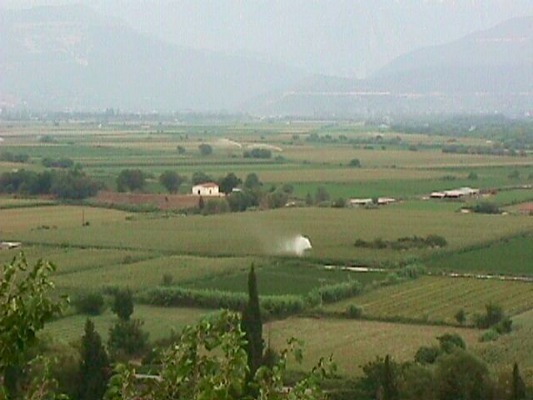 The ancient Necromancy is located at Mesopotamos of Preveza, at the location of ancient Ephyra. It was discovered by the excavations that took place there in 1958 – 1964, under the existing graveyard and the monastery of St. Ioannis (of the 18th century). The excavations took place under the orders of the professor of archaeology S. Dakaris. The visitors, here, along with the help of priests, got in touch with the souls of the dead and asked information about the future. The oracle was a little island at the lake of Acherousia of that period and it was surrounded by the park of Persephone. The oracle was like a fortress. At Odyssey of Homer, which was written in the end of the 8th century B.C., is mentioned the worship to Persephone and Hades. In Odyssey, also, is mentioned that Kirki the witch advices Odysseus to go to Hades and meet the soul of Teiresias the seer, so as to finnd his road to Ithaca. It seems that Homer had visited the region. Close to the necromancy there was also a downing gate to Hades. It was the only one necromancy in ancient Greece for the communication of the souls. The souls were spirits like shadows and predicted the future. The priests greeted the pilgrims and tested them into a psychological trial. The visitors offered a lot of the things for the purifying of the souls. The priests were the mediators, who with the help of iron wheels raised the idols of the dead from the hall which there was under the main hall. The visitors were leaving from another exit, so as not find the next visitors and keep the secrecy. The narration of what they had seen to others, was considered as a blasphemy and was punished with execution. Herodotus mentions the importance of the oracle and especially the prophecy of Melissa to Periandrus. The oracle was burnt in 167 B.C by the Romans. The state of Molossoi which had as a capital Passarona, had kings who had as their primary duty the war. So the worship of the god of the war made them construct the temple of Zeus the Martial which was the official place of worship for the state of Molossoi. Ruins of it there are nowadays at the same location where there was probably the city of Passarona, the capital of Molossoi on the foothill of Gardiki, 11 km. west to the city of Ioannina, close to Rhodotopi. On the top of the hill is still saved the cittadel. It was built on the 4th century B.C. It was destroyed in 167 B.C. by Aimilios Paul. It was recontructed during the Roman period and finally the place became a graveyard. Its location was found in 1914 by the curator of antiquities of that period D. Evagelidis, who made an attempt of escavation of the place in 1935. Finally in 1952 the archaeologist S. Dakaris discovered the monument. It is about a temple of Ionian rhythm with a yard which coincides with the ancient temple. Findings from the temple of “Zeus the Aryan” are exhibited at the Archaeological Museum of Ioannina. Kassopi is an interesting city of ancient Epirus in the prefecture of Preveza, close to Zaloggo, where its ruins are saved. It was built by the race of Kassopaioi of Thesprotia. It was their capital at a fortress on the plateau of Zaloggo, at a distance of 20 km. north to Nicopolis. I was built in the middle of the 4th century B.C. On its suburbs it had a polygonal wall. It had a population of 8.000 – 10.000 habitants and economically was very strong. ΕIt had its own coin, depicted Zeus and an eagle on a thunder. τIt had a market, deanery, two theatres, guesthouse, temples of worship of Venus and “Zeus the Saviour”. 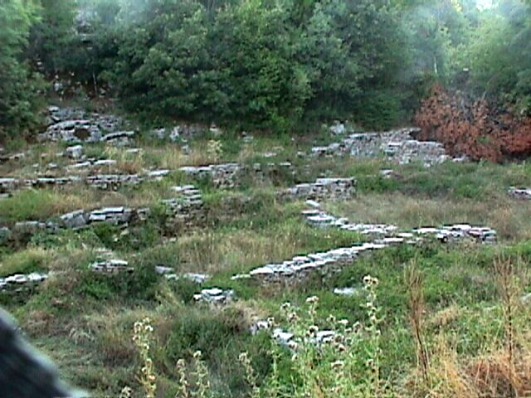 The first attempt for excavation at the site of Kassopi, was in 1951 – ’52 by the arcaherologist professor Sotirios Dakaris. Its findings are exhibited at the Archaeological Museum of Ioannina. It also preserved an underground tomb made on a rock, known as a “royal house”. This ancient temple is post-archaic and is located at the city of Arta, close to Kilkis square. The temple is built in doric rhythm. It is a part of the big temple of ancient Amvrakia of dimensions 20,75 Χ 44 metres. The temple dates back to 500 B.C. In this place it was found an inscribed column of the borders betwwen Amvrakia and Charadros. Charadros was a nearby city, in the region of Preveza. Nowadays the sign is kept at the Archaeological Collection of Arta. The temple is always open with free entrance. 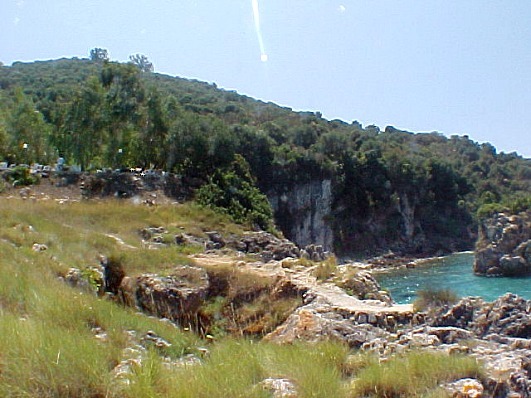 It is about one of the most important arcaheological sites of Thesprotia. 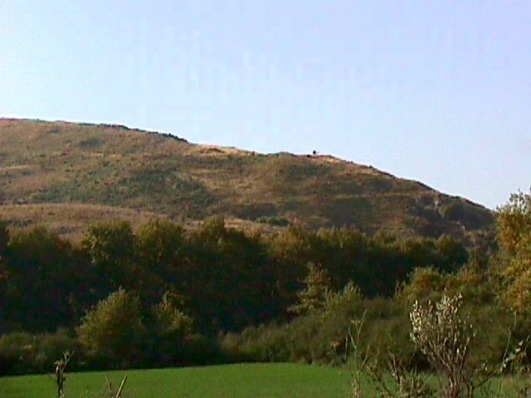 The cittadel of Velliani is on the slopes of Korila mount, eastern to the village of Chrysavgi as it is its name today (old Velliani) of Paramythia. Here there are ruinis of an ancient castle and ruins of Elea. Its wall with a perimetre of 1.550 metres, it was of excellent construction with an altitude of 6 – 7 metres and width 3,5 m.. Only few parts of the wall of the gate at the east side have been saved. In the inside of cittadel you can see the ruins of bulidings, the ancient market and a stone theatre of 3.000 – 4.000 seats, which prove that it was a cultural centre during the 4th century B.C. in its big development period, when it was the seat of the federal state “Common of Thesprotoi“, until 330 B.C. After the year of 330 B.C. the cultural centre was transfered to Titani. Many excavation have been done in 1985 and there were found prehistorical trails of settlements. The ancient Elea had under its jurisdiction the Necromancy of Acheron. 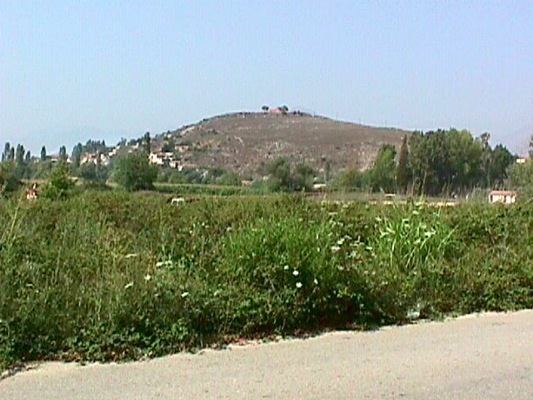 It had also the port of Ammouda (Splantza). Between the village of Vitsa in Zagori and Monodendri, it was found in 1965 an ancient village of Molossoi (settlement), that dates back to the 9th and 4th century B.C. The research finished in 1975. It is about a settlement of shepherds. At the north graveyard there were found 26 graves of the 8th – 4th century B.C., and at the south graveyard 151 graves of the 9th – 4th century B.C. The gifts on the graves were weapons, swords, knives and spearheads on the men’s graves, while on the women’s graves there were found jewels, necklaces, rings, etc. In all tombs also there were βfound ancient pots from Korithos and Athens from the 6th – 4th century B.C. and copper utensils. Findings from the palce are exhibited at the Archaeological Museum of Ioannina. Orraon was an ancient settlement built by the habitants of Kassopi in the 4th century B.C. 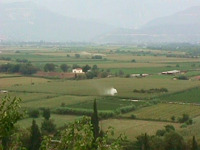 on the west foothill of Ksirovouni, close to the village of Ammotopos of the prefecture of Preveza. It is at a distance of 23 km. from the city of Arta. Orraon was the interchange of communication of Kassopaioi with Amvrakia and the sea. On the old wall was addited by the king Pyroos a new one with rectangular towers. Ita habitants resisted against the Romans in 168 B.C., but they finally conqured and destroyed it. In 31 B.C,, during the period of the emperos August, the habitatnts of Orraon moved obligatorly to Nicopolis of Preveza. Durimg the Ottoman period was the main access point to Preveza. Ruins of the setltlement have been saved in good condition. The site is always open with free entrance. Near the village of Thesprotiko, at the location of Kokkinopilo, there were found about 1.500 stone tools that are over 35.000 years ola (they date back to the last period of Ice Age) in a stretch of 4 geological strata. Stone tools of the same age there were also found to another places of the prefecture of Preveza. Pandosia was built in the 8th century B.C. and was the most important colony of Ileio close to Manteio (today’s Kastri). It was protected with a triple wall and from its one side by Acherousia lake. The first wall had many towers. It was conquered by the king Phillip B’, king of Macedonia, and was given in to the habitants of Epirus along with other colonies of Ileioi. After the giving of the town to the residents of Epirus, many people came here and developed a lot. It was destroyed by the Romans in 167 B.C., and after that they made it the seat of the “Common of Epirus”, with the right to cut their own copper coin. This seat in 148 B.C. was transfered at Dodoni. In the basin of Ioannina, among the villages of Gardiki, Vounoplagia and Zoodochos, 11 km. at the west side of Ioannina, is located by the archaeologists, the capital city of the colony of Molossoi, Passarona. It was found by the king Tharypas in 420 – 400 B.C. and made it capital, gathered a popoulation there and built its walls. King Tharypas governed the area with the help of a “Council of Nobles”. Here, Evripides taught “ANDROMACHE” (an hymn to Molossoi). Here was born Olympiada, Alexander’s the Great mother, and king Pyrros. Here also escaped Themistocles convented to death by the habitants of Athens and went to Asia with the help of king Admitus. It was destroyed by the Romans in 167 B.C. because it resisted. Aimilios Paul conquered the city, demolished the walls and burnt the Temple of Zeus the Aryan, in autumn of 167 B.C. Nowadays is saved a ruined polygonal wall on the top of the hill of Gardiki (at the location “Ikonismata” of today) along with the turkish barricades of the 1912 – 1913 as well as the temple of Zeus the Aryan, the holy centre where the assemblies of Molossoi took place. In the region of the village of Agios Minas of Zagori, near the exit of Voidomatis river and to the plain of Konitsa, there is a rockshelter, 11 metres higher than the riverbed of today’s river. During the excavations that took place inside the cave, there were found paleolithic tools of stone, residues of fauna as well as trails of fires at an extension of 80 s.m. The layers of the rocks date back to the paleolithic age and are about 10.000 – 16.000 years old. The excavations have started in 1993 and still are continued. 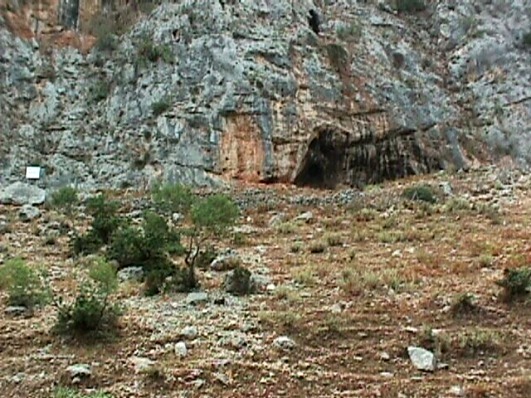 It seems that this cave was used by the hunters of the region who hunted the animals of the gorge of the plain of Konitsa. 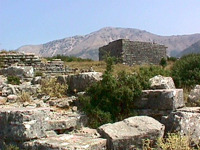 Ephyra is one of the oldest cities of ancient Epirus. It was located close to the village of Mesopotamos. It was the most important colony of Ileioi located at the meeting point of Kokytos river and Acheron river, close to Nekromanteio. It communicated with Cheimerio port and became a big trading centre. In 1400 – 1300 B.C. 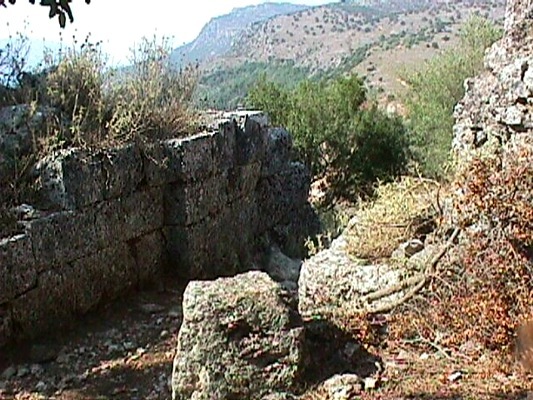 came to the region colonists from Mycenae and built huge walls of 1.200 metres, just like the walls of Tyrintha, under the orders of the king Achaios. Here there were found tombs from the Iron Age. The king Phillip B’ gave the city to the habitants of Epirus. It was finally destroyed by the Romans in 167 B.C. Homer, mentions in Odyssey, the meeting of goddess Athena with Telemachus, in Ephyra. Here it was located the famous Nekromanteio but also one of the gates to the Cathode to Hades. At this place came the hero Hercules so as to go down to Hades and liberate Theseus, according to mythology. From Ephyra of Thesprotia was also Antifos, who took part in the Trojan War as a captain of a navy with 30 ships. 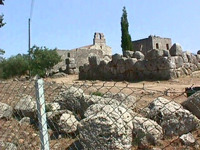 At Karavostasi of Perdika there is the archaeological site of Dimokastro. It is on a hill where three walls surrounded an area of 220.000 s.m. of the ancient settlement of Elina. The east side of the walls dates back to the 4th century B.C., while the west one dates back to the 3rd century B.C.. Among the ruins there are concrete building stones, arcades and drainage pipeline. Under the hill on the coast, you can distinguish the ruins of the wall under the water. 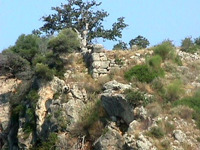 At the north side of the settlement, at a distance of 600 metres, there are the ruins of a temple of the 4th century B.C. The location connects with the ancient town of Elina, which during the period of its development had 6.000 habitants. ΑThe ancient town of Elina is mentioned on an ancient sign that was found in the archaelogical site of Dodoni. At the centre of the settlement, it was found a big building (probably a significant public buliding). At the same space there were found significant findings (coins, potteries, mask of gods made of copper, etc.). 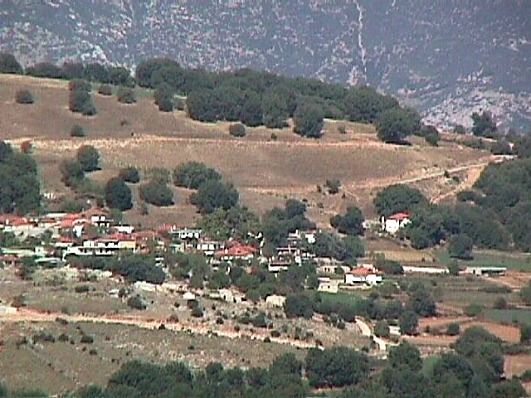 The ancient town of Vouchetio was built on the 8th century B.C. at Louros river which was an exit to the sea. It was built at the location of Rogoi which is between Petra and Nea Kerasounta of Preveza. It was a colony of Ileioi. In the past at the same location there was a prehistoric settlement. It took its name by Vouchetos, the son of the king Echetos, or according to the mythology because there escaped the goddess Themis on a bull’s back, during the deluge of Deucalion. The compound at the top of the hill had old walls with towers and battlements. The findings date back to the period of the 6th century B.C. and the roman age. The ancient walls were destroyed by the Romans in 167 B.C. because th habitants of Kassopi were allies of Molossoi. At the south side of Ioannina on the edge of the lake, close to the village of Kastritsa there is a cave. By the excavations, which they have not been finished yet, have been found four embankment fills at a depth of about 10 metres. The last fill dates back to 11.000 years. There were found stone and bony tools (blades, picks, etc.) as well as animal bones of the paleolithic age. The findings are displayed at the Archaeological Museum of Ioannina. Close to the village of Rizovouni of the prefecture of Preveza there was the ancient town of Vaties, which was a colony of Ileioi. It was built on a hill and was surrounded by a polygonal wall, parts of it are saved till today. Three gates and two doors are distinguished. It had also internal walls. On the walls there are also roman extensions. At the 5oth km. 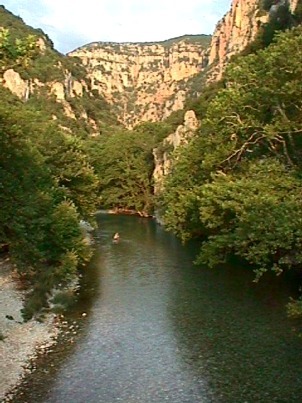 of the national road of Ioannina – Athens in the gorge of Louros river there is the cave of Asprochaliko. The cave was excavated and were found bones and other objects of the stone age. There were found 3 levels (during the excavations of 1964 – 1965) with numerous tools of paleolithic era (40.000 – 12.000 B.C. ), stone blades, etc., as well as animal bones (of rhinocerus, bear, etc.). With these findings is proved that the human presence in Epirus dates back to 40.000 B.C., in the middle paleolithic age. It is about the glacier age when the man lived by hunting and stayed in caves to protect himself from the cold. This period ends up in 6.000 B.C. 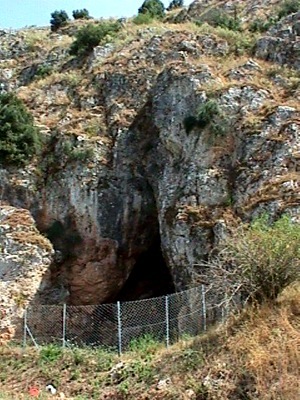 The cave of Asprochaliko is one of the most important paleolithic caves of Europe. 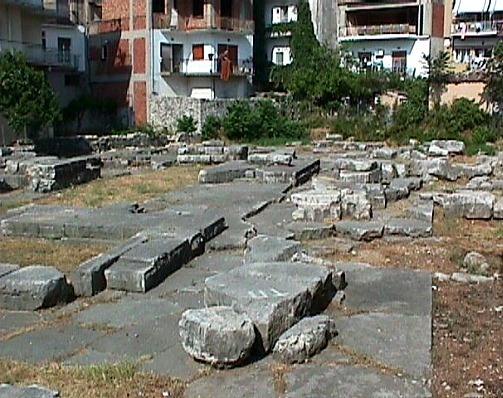 The king Tharipas built this town, by gathering population from the prehistoric settlements of the basin of Ioannina. It was located on the hill of Kastritsa, at the south side of the lake of Ioannina. During the years 425 – 400 B.C. the town was protected by walls. 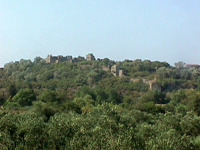 On the top there are ruins of the Molossian acropolis (a polygonal buliding). The town had a great strength, but in 167 B.C. was conquered by the Romans despite its heroic resistance not to surrender. Before the fall of the town, the leader of the defended (Kefalos) was defeated heroic and was killed, rejecting the desicion for the fall of the town. The town was finally abandoned on the 5th century A.D. when Ioustinianos bulit the town of Nea Evroia and its castle (Ioannina of today). Titani is located at the middle of the route of Igoumenitsa – Sagiada, close to the dam of Kalamas where the river of Kalamiotikos meets Kalamas river, at the slope of the mountain of Vrysella. It is about the biggest ancient settlement with walls of the other 45 of Thesprotia, and in the past was the capital city of the federal state of “the coommon of Thesprotoi” and a big political centre after the year of 330 B.C. The perimeter of the walls, 2.400 metres, surrounds a settlement of big extension. On the 4th century B.C. the place developed a lot and was the centre of King Pyrros. It is about Titana, which Polivius mentions (it was found a relative resolution). The city was destroyed by the Romans in 167 B.C. with other many cities of Epirus of that era. Outside its walls it was revealed a looted graveyard and at a distance of 2 km. from it another one. On its ruins are distinguished: a market, two temples, public buildings, theatre, galleries, houses, stages and ruins of a library and public baths.